Ten years ago I was lost, afraid, and totally broke. I had climbed the mountains of underground music and reached for the stars, married and divorced, produced a lovely child, built a wonderful studio, made thousands of friends, performed for millions of people, and had never been more unhappy before in my life. I forfeited absolutely everything I had worked for, and retreated to a place I called the treehouse, where I endeavored to re discover what I ever saw in house music. The first project was to challenge myself with producing seven tracks in seven days. I limited myself to five pieces of equipment, and 24 hours to produce a viable track. I did this completely publicly, and posted all of my plans, and all of the results as I went. This became my first solo album ‘Seven Tracks in Seven Days’ which was available for all concerned to listen to on (the then mighty) DUB messages message board. Hisa at King Street asked about putting the record out, thanks to the wonderful Peter Woholeski for pointing it out to him, and about a year later I was touring Japan, and had launched a career as simply myself. Then I started up a weekly internet radio broadcasting situation called Sunday Soul which was originally intended to be a place to regather my roots, my friends, my music and enter into conversation with people I admired. Jenö, Jonah Sparp, Velocette, Rick Preston, Adnan Sharif, Gino Gabriele, Deadpan Rambler, Dubtribe, Moonbeam, and many others joined me in a dialog about where they came from, and where they were headed. It was humble, unassuming, and totally inspirational. This opened my mind to the idea of virtual radio, digital music, and digital performances. I shifted, in part due to lack of resources, and in part due to a lack of perceived audience, and certainly due to a lack of personal momentum, from a collector of synthesizers, mixer of vinyl records, and manufacturer of physical merchandise toward embracing the modern world. I opened up Treehouse Muzique as a place to set my sketches down, a safe and carefree destination for re edits, reworks, and experiments. Soon it became a place to host long, five hour archives of Sunday Soul, and a way to produce t-shirts on any whim I had and offer them for sale to people at cost. For ten years it has served me as a place to keep my secrets safe, and hold a space for the love I have in my heart of house music. Anyone who knows me knows that when I say house music I don’t mean what those who live by classifications and genres thinks of when anyone says “house” – You know… that middle of road nothing which isn’t “deep” and isn’t “techno” but falls outside of the interesting.. that – What I mean when I say house music is absolutely anything which anyone can syncopate, and mix together to move a room. It’s all house music to me. House is not a micro genre, but rather it is the universe in which all music with the intention of love, unity, positivity, truth, and vibrance is held. I wear the idea of house personally, loosely, freely… and wherever anyone goes, however divided up they become, it will all, always come back to house. These are not my ideas. I have undertaken the visionary thinking of my heroes like Larry Levan, David Mancuso, Frankie Knuckles, FK, Doc Martin, and more… These aren’t negotiable concepts to me, they are truths. Truths which I demonstrate every weekend in front of kids who don’t know what they like yet, radiant queens who are fierce about what they need and how they want to feel, dullards who think they know things and are urgently desperate to put everything into a box, but won’t climb out of their own, and people who simply want to dance and feel free. So don’t get me wrong… when I say house, I mean house. Jack’s house. My house. Two years ago it began to be clear to me that this little hideout of mine wasn’t holding all of my heart anymore. I was looking at broader horizons, talking about a new Dubtribe album, thinking about where to go from here. A great trip to Europe, lots of DJ gigs across the world, and my head was beginning to shift again. I could feel the tickle of the winds of change just starting up as a breeze in my hair. My second and third solo albums (Gasmasks and Crazy-Girls (Cosmic Disco) and Bélle Âme Électronique (King Street)) hit home with some folks, but largely missed the mark, and it felt, touring Europe and making so many new friends, and moving crowds so effortlessly with my voice, and my deeper beats that there was a serious disconnect between the things I was expressing in a performance, and these finished recordings, re edits, experiments which were really only placed for safe keeping at Treehouse. I looked around and wondered how anyone heard about anything… we seemed to have transformed from a world of specialized culture, print, art, and recordings which people were talking about and exploring and experiencing in person into a world where everything was barely a theory… digital fodder was flying at everyone from all directions all the time, and rather than opening up the world to liberate us, the digital world had closed us down, made us numb, and fractured our abilities to connect, to deepen, to love. Now a lot of people might have a lot to say about this realization of mine, but ultimately it was my moment, and from there I have been finding my way home. I don’t want to be disconnected from you. I don’t want to stand in contempt for how you choose to communicate, connect, or curate your lives. I want to be with you. I want the music which I produce to be as legitimate and vital as the performance I offer you. I was just beginning to consider setting down the computer and getting back to work in the real world when the window of my rental car was smashed in a 9 minute trip to the bank, and my entire life was stolen. Laptop, hard drive, entire music collection, microphone, everything – gone. I couldn’t really handle it. People were so good to me, and lent a hand helping me to recover myself, offering donations, music, hugs. But I couldn’t get my head out of all that I’d lost. So I asked myself after deciding that really nothing could actually be that bad “when was I last happy, and productive?” and the answer was immediate – When I was playing live. So rather than make an effort to replace what was lost (which was impossible) I began to assemble the building blocks of live performance. I scored a drum machine, and a few synthesizers and booked a tour. I toured and it was amazing. And now I am home, 18 months later, recording an album, exploring modular synthesizers, reaching further into myself, and outside of myself than I have before and feeling totally connected, beloved, and free. 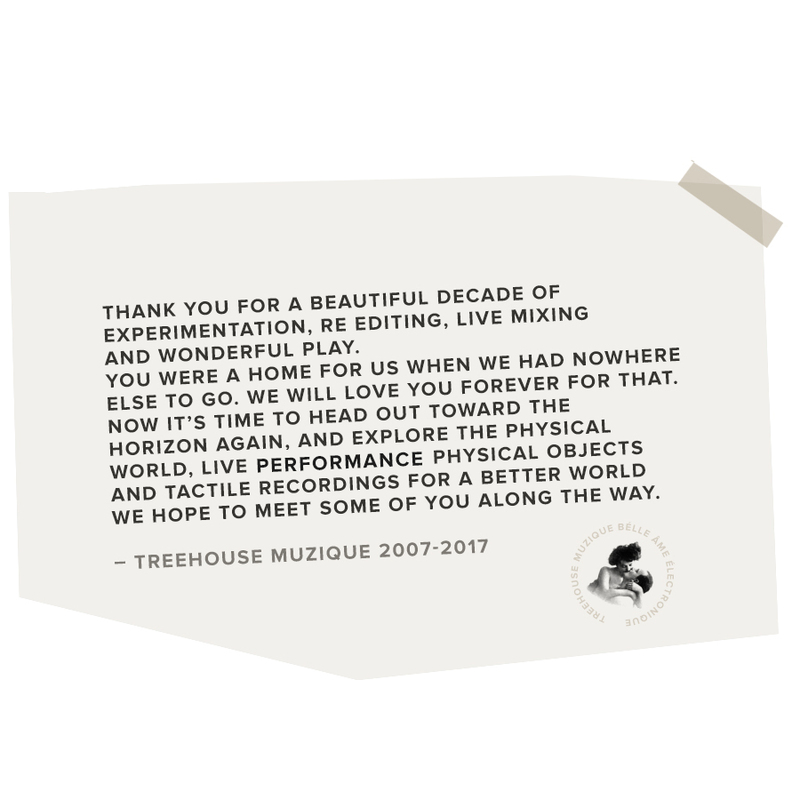 And so on the 10th anniversary of Treehouse Muzique I feel it’s only appropriate that we close her doors and say thank you. It is time to seal the digital vaults, and abandon these meaningless, temporary things and return to the light, back to the business of operating machines, feeling electricity move through our fingers, and setting needles down onto the records. I just don’t take my inspiration from computers anymore. They’re a distraction, and I’ve come to see that the laptop, the mobile phone, the tablet may be useful and essential tools for communication, work, and remotely controlling the temperature of your fish tanks, they are not inspirational, nor revolutionary tools. So I no longer wish to contribute my energy to this world. Many people have been attempting to negotiate with me, saying things like “I’ll pay for the record, but I only want the WAV file” because they either don’t want another 12″ single to be pressed for the sake of the environment, or because they don’t actually have a turntable – all good reasons to protest, but I am standing up for eye contact, for cables physically connected, electrical signals recorded into grooves, and how nothing feels better than making the effort, saying the words, and taking the action. I’ll see you soon with the debut release on my new label The Urgency Of Change, pre orders will be taken soon, and the debut release is looking like an early July arrival. And more… so much more. But for today, on the tenth anniversary of Treehouse Muzique I wanted to say thank you, I love you, and I am so grateful for everything. @Neil Fox – I love you too! Loved everything you did there Sunshine! Much love brother! Happiness and sadness, rolled into one…much love!! birth / rebirth.. room to stretch n grow. excited to see what comes next from your electric creativity. You’ll see I have a little announcement to make in a few minutes. Listen to your heart! So proud of you man.